The Board of Directors ensures that the public and charitable role of the Regiment will be carried out in a way that is effective in furthering the mission of the organization. Since the Regiment is a non-profit, charitable corporation, the members of the Board of Directors are responsible for guiding the Regiment to its charitable goals. It is the Board’s job to see that the Regiment is faithfully carrying out its purpose without extravagance or waste. The Board is responsible for making sure that the Regiment is financially accountable; that it is not allowing charitable assets to be used inappropriately or diverted to private interests; that the organization has mechanisms in place to keep it fiscally sound, and that it is properly using any restricted funds the Regiment may have. *Promote the visibility and growth of the Regiment as a non-profit historically focused organization. * Provide guidance and direction to the Regiment in continually improving its portrayal of a British military unit in North America during the early years of the American Revolution. *Advise the Regiment in how to enhance the reenacting experience of its members and assist in maximizing the Regiment’s visibility with the public, thereby improving its ability to recruit new members. The Board of Directors shall consist of three permanent members: the President of the Corporation (the Commanding Officer, holding the rank of Lieutenant Colonel); the Clerk (the Adjutant); the Treasurer (the Paymaster). In addition, one “At Large” director from the Regiment’s membership and three other directors who are not members of the Regiment shall be elected to the board annually. Chair of the Board: Don N. Hagist, an engineering consultant in Rhode Island, was elected Chair of the Board in 2015. 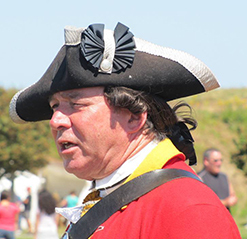 His historical studies focus on the British forces that garrisoned Rhode Island from December 1776 through October 1779, and the demographics, operations and material culture of the British army during this period. This research is done using exclusively primary sources, starting with regimental muster rolls and building upon that information with pension records, orderly books, War Office correspondence, and a wide range of other archival materials, with the goal of presenting an accurate picture of individual common British soldiers who served in America. 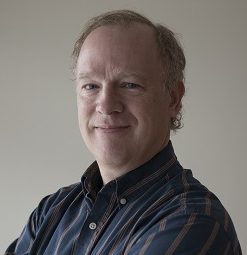 He is an editor for the JOURNAL OF THE AMERICAN REVOLUTION, has published several books including British Soldiers, American War (Westholme Publishing, 2012) and numerous articles in publications including the Journal of the Society for Army Historical Research. 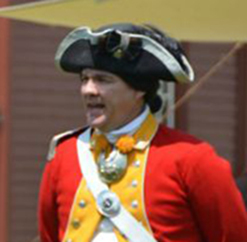 Jim O’Brien is currently the Director of Public Events at OLD STURBRIDGE VILLAGE and is responsible for all their special events including the village’s signature event Redcoats and Rebels. Jim has been on the village staff for over 35 years and is equally at home as an administrator or costumed historian and has totally enjoyed his career in in living history. In 2005 Jim was honored to have been chosen as one of the site managers for the Outdoor Living History Museum Interpretation Project teaming Old Sturbridge Village with Conner Prairie Interactive History Park, from Fisher’s Indiana , in a national study with the American Association for State and Local History and the Institute for Learning Innovation. This three year project focused on visitor reaction to presentations of first person, third person and museum theater interpretive presentations and their effect on the guest experience. As a result of the project Jim was fortunate to travel extensively presenting on panels at national conferences including the American Association of Museums, the Association for State and Local History, National Association of Interpreters, the Association for Living History Farm and Agricultural Museums and the New England Theater Conference. He is co-author of the article Why Research? You Might Get Some Surprises!, which was published in History News in 2009 detailing this project and the article The Redcoats are Coming and So are the Guests in: Best Practices for Hosting a Military Reenactment (ALHFAM Journal, 2013) based on the success of Redcoats and Rebels. 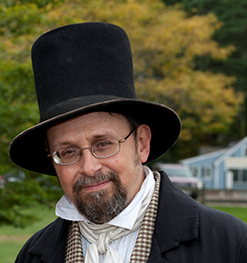 He is also a frequent contributor The Old Sturbridge Visitor the village’s quarterly magazine. Jim has also had the pleasure of doing extensive media work representing Old Sturbridge Village on television and radio since he joined the staff of Old Sturbridge Village in 1980 after getting a degree in Music Performance from Annhurst College. You can hear his music featured on the North Star Records recording Village Green: Dance Music From Old Sturbridge Village, released in 1994 and on Old Sturbridge Village self-produced A 19th Century Musical Sampler, Music of Old Sturbridge Village, released in 2009. 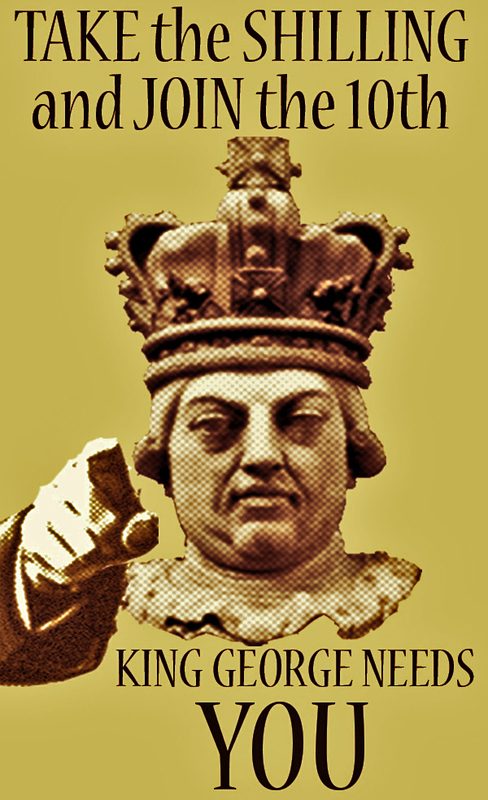 Jim feels honored to have been asked to sit on the Board of Directors of His Majesty’s Tenth Regiment of Foot and looks forward to helping to ensure the quality and brand of this stellar organization. President of the Corporation: Lt. Colonel Robert Falotico, Officer Commanding, joined the 10th Regiment of Foot in 2000. Initially he was sworn to service as a drummer, but soon moved on to be a private soldier in the Light Infantry Company. He received his Officer’s Commission as a Lieutenant at Yorktown Battlefield in 2006. He eventually became Captain of the Light Infantry Company and served in that position until January 2015 when he was promoted to Lieutenant Colonel and Officer Commanding of the 10th Regiment. 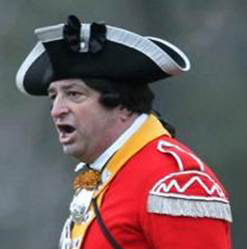 He is passionate about continuing the great traditions of the 10th Regiment in the areas of historical accuracy and educating the public about the American Revolution from the British perspective, and looks forward to the new 10th Board of Directors being integral to expanding and continually improving the charter of the 10th Regiment as a leader in the reenacting community. Outside reenacting Bob is Vice President, Industrial Market Sector for an Environmental Consulting Firm that provides technical services to industrial manufacturers with environmental liability issues. He resides in Wrentham, Mass. with his wife Lisa. They have two daughters, one who lives in Jamaica Plain with her husband and works in Boston, and another who lives and works in Washington, DC. Clerk: Major Michael V. Graves, Adjutant, was sworn to service in the 10th Regiment on Patriot's Day 2006 as a private in the Battalion Company. Over the years he has held many positions in the regiment including Serjeant of the Light Infantry Company and Captain of the Grenadier Company. He currently serves as Adjutant for the regiment and manages the Regimental web site. Michael lives in Chelmsford Mass with his wife Valerie, who is a member of the 10th's Corps of Civillian Volunteers. Treasurer: Capt. 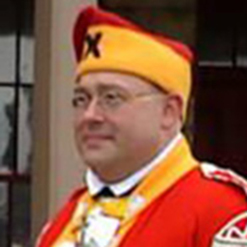 Shaun Timberlake is the Regiment’s Corporate Treasurer (known historically as the Paymaster) and CO of the Light Infantry. Running the business side of the Regiment, Shaun’s duties include maintaining the Regiment’s finances and bank accounts, insurance coverage and filing of state and federal informational returns. Shaun joined the Regiment initially in 1995 staying until 2000. Shaun rejoined the group in 2009 and took on the Paymaster’s position in 2010. Shaun is a 1998 graduate of Bentley College (now University) in Waltham, MA, with a Bachelor of Science in Marketing. While in the 21st century, Shaun is an insurance broker in Randolph, MA, and resides just south of Boston in the City of Quincy with his wife Kara. Aside from his historical interests, Shaun enjoys traveling and sightseeing, visiting family and making the most of his down time. At Large Member: Colonel Paul O'Shaugnessy joined the Regiment as a Light Infantry Private soldier in 1972 while working as a summer tour guide on Lexington Green. He remained with the Light Infantry for 25 years before serving as Commanding Officer from 1997 to 2014, and now serves as Quartermaster of the Regiment. His basement serves as a Regimental storehouse and a workshop. He assists the New England Revolutionary War avocation as a regional coordinator for the British Brigade and the Boston Garrison, a webmaster for BATTLEROAD.ORG, and an organizer of several annual re-enactment events in New England. Paul is currently a Board member and past President of the LEXINGTON HISTORICAL SOCIETY and also a Board member of the FRIENDS of MINUTE MAN NATIONAL PARK. In his spare time, Paul serves as a Board member, actor, and Technical Director for The Footlight Club in Jamaica Plain, MA. An Electrical Engineering graduate of Cornell University, Paul works as Director for a biotech manufacturer based in Woburn, MA. He lives happily with his wife Diane (who works as a Tour Guide for the Historical Society) and their several cats in their cool 1950’s cape home in Lexington, Massachusetts.